This show deserves a big venue and big audiences. Bromance is absolutely brilliant! The strong friendship between male friends involves respect, loyalty, playfulness, competition, humour, love and always looking out for each other. All of these aspects are beautifully fused together in Bromance, as well as, thankfully, the ability to catch each other when someone falls. Bromance is plugged as a physical theatre/circus show, but it also involves some great dance, comedy and some fantastic acting during some very poignant gentle moments. The music, use of stage and all the other creative elements were spot on tonight. The three men onstage, Beren D’Amico, Charlie Wheeller and Louis Gift have such incredible fitness, strength, and flexibility. They were all outstanding and all had moments to shine and make the audience gasp and cheer. It was not just one trick after another though that makes it stand out, but the build-up that occurs to engross the audience to ensure maximum impact in the end. This is the Australian premiere of Bromance at the Adelaide Fringe and it is sure to win a lot of awards, as it already has done in the UK. Don’t miss this one! Bromance continues at the Royal Croquet Club’s Ukiyo until Sun Mar 15. Royal Croquet Club’s Ukiyo, Sat Feb 14 This show deserves a big venue and big audiences. Bromance is absolutely brilliant! The strong friendship between male friends involves respect, loyalty, playfulness, competition, humour, love and always looking out for each other. All of these aspects are beautifully fused together in Bromance, as well as, thankfully, the ability to catch each other when someone falls. 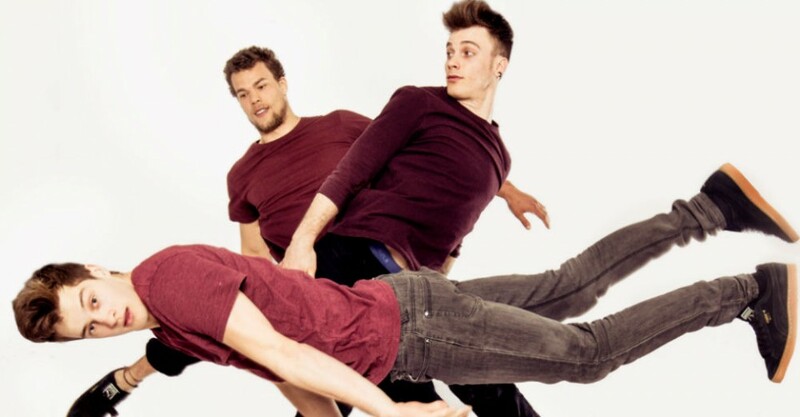 Bromance is plugged as a physical theatre/circus show, but it also involves some great dance, comedy and some fantastic acting during some very poignant gentle moments. The music, use of stage and all the other creative elements were spot on tonight. The three men onstage, Beren D’Amico, Charlie Wheeller and Louis Gift have such incredible fitness, strength, and flexibility. They were all outstanding and all had moments to shine and make the audience gasp and cheer. It was not just one trick after another though that makes it stand out, but the build-up that occurs to engross the audience to ensure maximum impact in the end. This is the Australian premiere of Bromance at the Adelaide Fringe and it is sure to win a lot of awards, as it already has done in the UK. Don’t miss this one! Bobby Goudie Bromance continues at the Royal Croquet Club’s Ukiyo until Sun Mar 15. Book at FringeTIX on 1300 621 255 or adelaidefringe.com.au/fringetix. Click HERE to purchase your tickets. Such incredible fitness, strength, and flexibility. Absolutely brilliant!